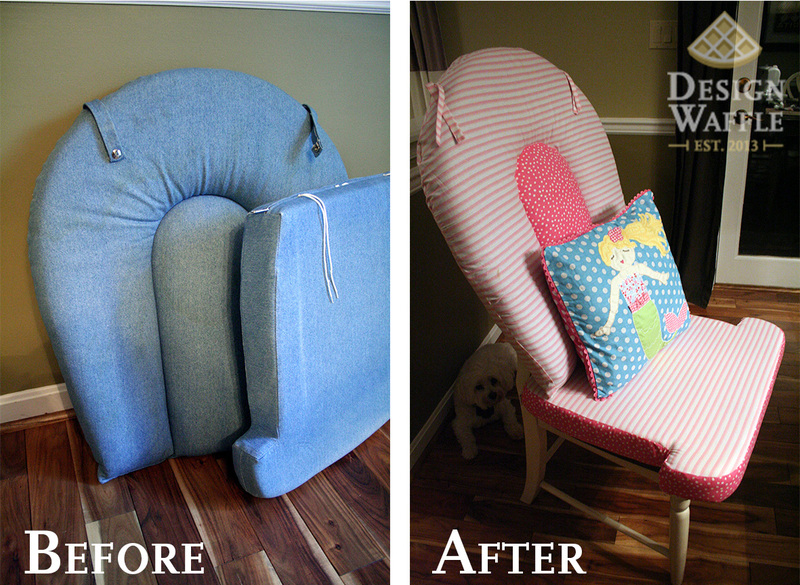 A couple weeks ago I was asked to recover two cushions for a rocking chair. I feel I may be turning into a cushion expert and now that I think about it… these sewing projects are quickly consuming my blog. I had NO IDEA how much I sewed until I started documenting it. I also started wearing my house slippers quite a bit too. I’m becoming worried about myself. And not to mention… my 26th birthday is on Monday, June 10th. I’m feeling 86. Sigh…. Well anyway, onto the next sewing project. I’ve lost count on the cushions at this point but they’re all so different and have their own set of challenges. 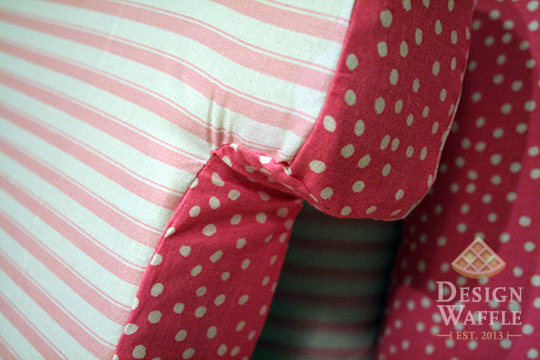 This particular cushion has a deep arch-shaped crease in the back cushion, and the bottom cushion has some funky corners (which actually aren’t funky, but rather tricky to sew). The old fabric was a heavy jean material that was faded and worn. 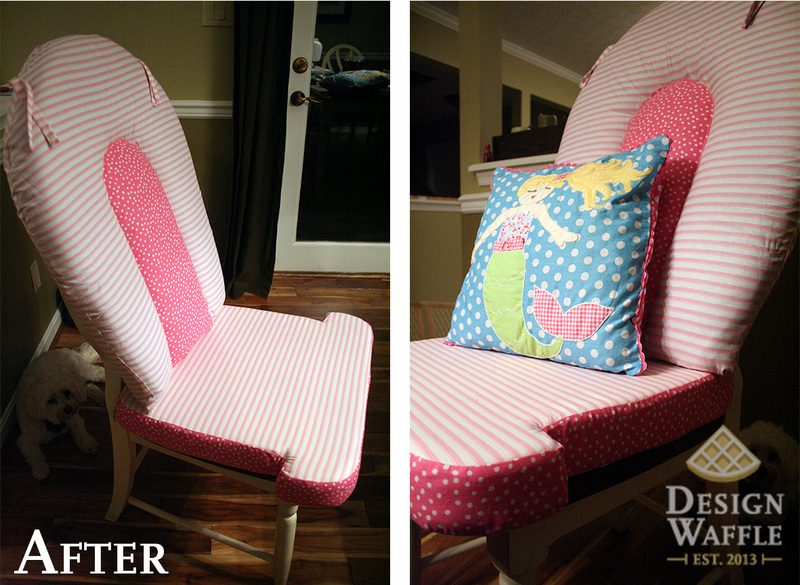 The updated chair is for a family friend’s mermaid themed nursery. That little polka dot mermaid pillow came from Pottery Barn, in case you’re wondering. 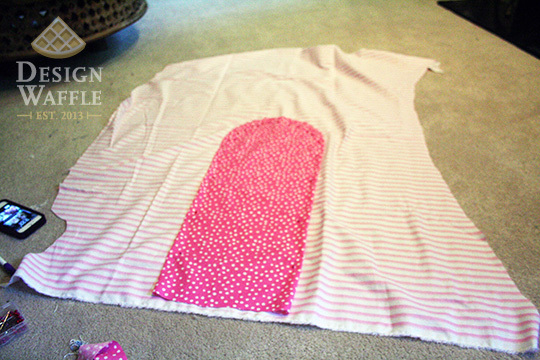 As always, I pulled the fabric off the cushion with a seam ripper and used the old fabric as a template for the new fabric. 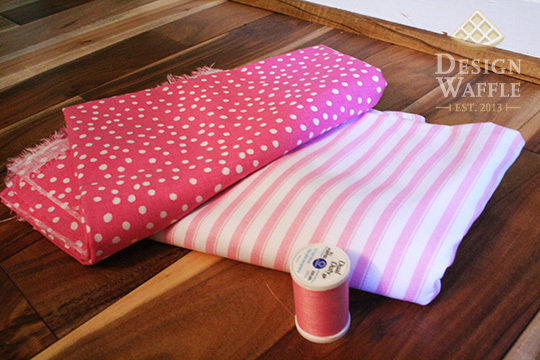 I sewed the zipper panel and then attached the side pieces that form the edges of the box cushion. 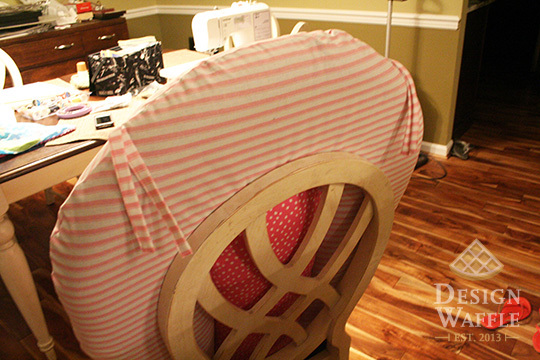 Then I fit the fabric pieces around the cushion and pinned it in place to make sure it would have a nice snug fit. From there I continued to sew the whole cushion. I went with a two-tone look for the back cushion to emphasize the arch-shaped crease/seam thingy going on in the cushion. 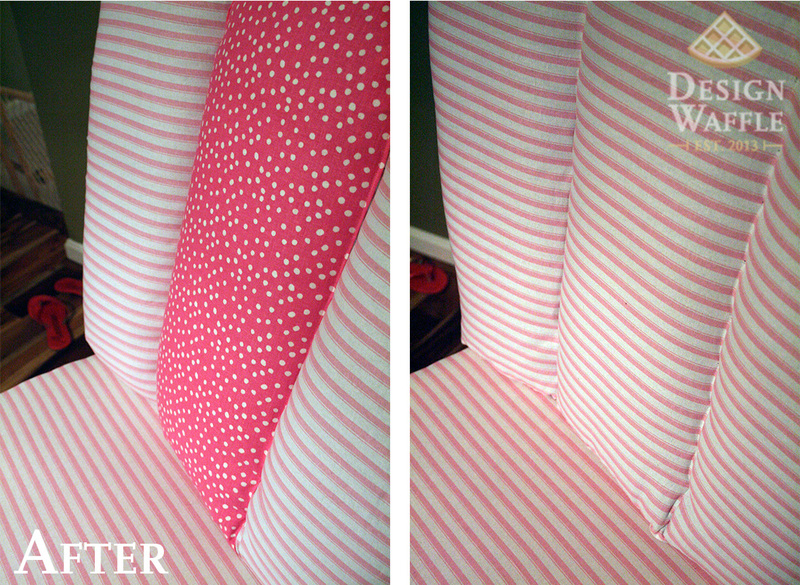 I sewed the two pieces together prior to forming the cushion cover. This cushion already had a deep arch-shaped seam. 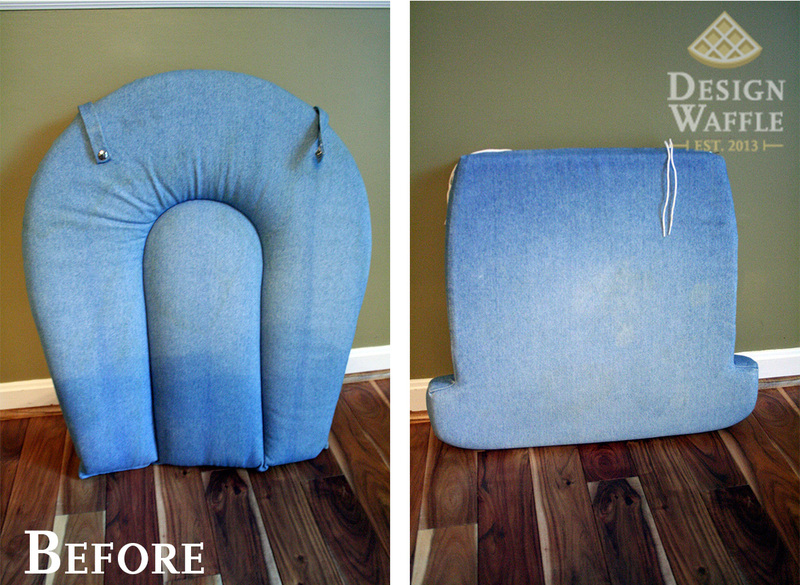 I wanted to keep that shape but the cushion was way too thick to send through the sewing machine. Instead, I sewed a few stitches every 2 inches in the crease. You can see the slight scalloped shape of the arch if you look closely, which shows all the little stitch places. 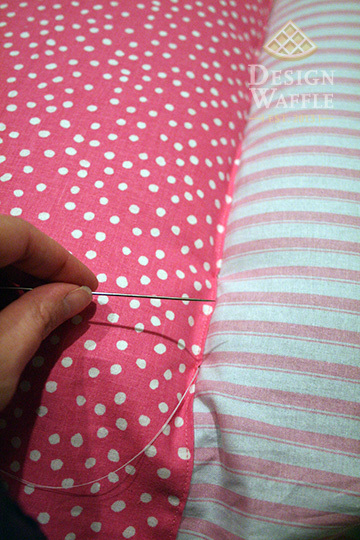 I used an upholstery needle for this part since it’s longer and much stronger than a regular sewing needle. 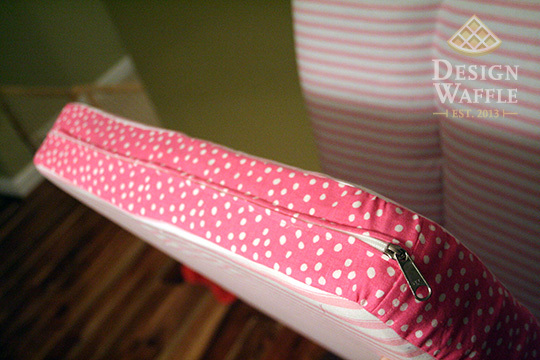 After hand placing those stitches, I sewed the bottom of the cushion shut… by hand. Here’s the finished cushions! I don’t have a photo of the cushions on the rocking chair yet. But I’ll be sure to add it as soon as they’re reunited with the chair. Can you spot the dog?! Kimble is being his usual sneaky self. 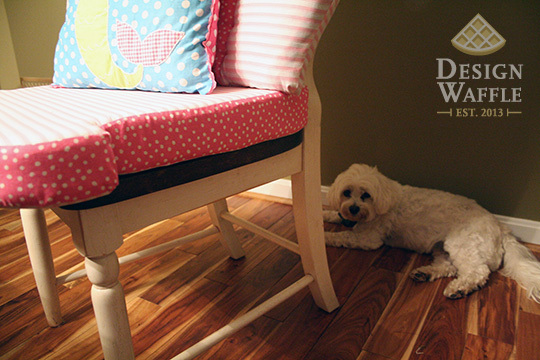 He’s like Where’s Waldo in practically all of my blogged projects. Silly dog. I hope this new baby girl loves her rocking chair. I’m sure it will quickly become a special place for mommy and baby. 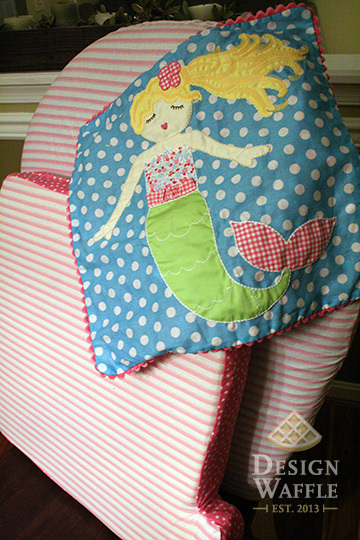 This entry was posted in DIY Projects and tagged Baby Nursery Chair, Design Waffle, Girl Nursery, Mermaid Themed Nursery, Pink, Rocking Chair Cushions. Bookmark the permalink. Deborah, I just used a standard cotton fabric. I would usually use an upholstery grade material but the person who requested the cushion provided the fabric.